DECRIPTION OF THE BOOK: A room locked for fifty years. A valuable peacock ring. A mysterious brother-sister duo. Paloma Marquez is traveling to Mexico City, birthplace of her deceased father, for the very first time. She’s hoping that spending time in Mexico will help her unlock memories of the too-brief time they spent together. While in Mexico, Paloma meets Lizzie and Gael, who present her with an irresistible challenge: The siblings want her to help them find a valuable ring that once belonged to beloved Mexican artist Frida Kahlo. Finding the ring means a big reward — and the thanks of all Mexico. What better way to honor her father than returning a priceless piece of jewelry that once belonged to his favorite artist! But the brother and sister have a secret. Do they really want to return the ring, or are they after something else entirely? Her attitude slowly begins to change on their first night in Coyoacán, when Paloma and her mother attend a party at Casa Azul, Frida Kahlo’s former home turned museum. Paloma cannot help being absorbed by the vivid colors, mariachi music, delicious guanábana drinks, and the intriguing artist whose images permeate the museum. It certainly doesn’t hurt that very cute boys are in attendance, like Tavo, the son of Mr. and Mrs. Farill, the wealthy benefactors of her mother’s fellowship, or Gael Castillo, an aspiring artist, who along with his sister, Lizzie, a talented trumpet player in a mariachi band, recruit Paloma to seek out Frida’s peacock ring. Her encounter with these characters at Casa Azul is no accident. The location is at the heart of the unfolding mystery, not only because it is the scene of the crime, but because all the characters have a connection to it. And, just like Casa Azul houses secrets beneath a vibrant exterior, Paloma soon finds that the outward charm of her new acquaintances belies their true intentions. Before Paloma decides to join the Castillos in their investigation, she dreams about Frida, who tells her, “It’s true I am missing something…But you’re missing something, too.” Although Paloma is half Mexican (by way of her father, who died in a car accident when she was a toddler), she is disconnected from her heritage, and experiences a bit of culture shock when she first alights in Mexico. She worries about “all these kidnappings going on” and the “drug trafficking kingpin dude.” Her mother, who is white, dismisses Paloma’s concerns as “nonsense,” but admits, “I haven’t done a good job of exposing her to her Mexican heritage.” Cervantes parallels Paloma’s cultural development with the mystery plot, fittingly, since her own identity requires piecing together memories her mother shares of her father, and jotting them down on notecards. It is through Frida, though, that Paloma begins to explore her Mexican side independently. She connects with the icon’s life and art, including her mixed heritage and penchant for self-portraits (likened to selfies in the text). Her exposure to Mexico also serves as exposure for some readers, who may have little to no familiarity with the nation. Although the focus remains on Frida and not Mexico at large, it is a positive step toward creating more positive associations of Mexico for a wider readership. Although Paloma is initially apprehensive about her possible role in solving a mystery, she cannot help but be intrigued. After all, she is a big fan of mysteries herself, and cannot pass up an opportunity to flex her sleuthing skills. She constantly emulates her favorite literary crime solver, Lulu Pennywhistle, who is both an acknowledgment of the middle grade mystery canon (think Nancy Drew or Trixie Belden), and a subtle commentary on it. Me, Frida and the Secret of the Peacock Ring, is one of very few titles to feature a young protagonist of color, take place in a Latin American city (if any), and focus on the legacy of a female Latinx artist (none; please correct me if I’m wrong). But here now is Paloma Marquez, with keen eyes and note cards in hand, to inspire a new generation of mystery buffs. Art history itself is a favorite subject of the mystery genre for children. Many titles, like the classic From the Mixed-Up Files of Mrs. Basil E. Frankweiler by E.L. Konigsburg, and more recent fare like Chasing Vermeer by Blue Balliett and Under the Egg by Laura Fitzgerald depict novice investigators exploring the history of an artist or artwork to ultimately save the integrity of the art itself, the adults too naive or cynical to do the job themselves, and sometimes even their own fates. More sophisticated readers of the genre may foresee the revelation of the story’s villain, but the lack of suspense is offset by the fantasy of slipping into the role of crime solver, just as Paloma experienced. And indeed, her discoveries about herself are as integral to the narrative as the whereabouts of the ring. 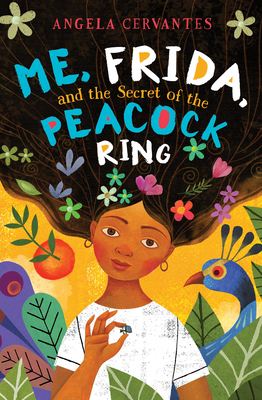 When readers catch a glimpse of Rafael Lopez’s stunning cover art for Me, Frida and the Secret of the Peacock Ring, they may not think they are holding a mystery at all. No dark doorways or creepy staircases. No pointed flashlights or magnifying glasses. Instead, there is Paloma gazing directly at the viewer, evoking Frida’s signature portraits, framed by lush, floral elements, and of course, a peacock (although there is no real peacock ring, Frida was famously an animal lover). She is inviting readers to take a look at all she has uncovered. ABOUT THE AUTHOR: Angela Cervantes is the author of the critically acclaimed novels Gaby, Lost and Found and Allie, First at Last. Angela is the daughter of a retired middle-school teacher who instilled in her a love for reading and storytelling. Angela writes from her home in Kansas City, Kansas. When she is not writing, Angela enjoys reading, running, gazing up at clouds, and taking advantage of Taco Tuesdays everywhere she goes. Click here for a recent Q&A with Angela Cervantes. ABOUT THE REVIEWER: Jessica Agudelo is a Children’s Librarian at the New York Public Library. She has served on NYPL’s selection committee for its annual Best Books for Kids list, and is currently a co-chair for the 2018 list. She contributes reviews of English and Spanish language books for School Library Journal and is a proud member of the Association of Library Services to Children and REFORMA (the National Association to Promote Library and Information Services to Latinos and Spanish Speakers). Jessica is Colombian-American and born and raised in Queens, NY.